Ivy Malone has a curiosity that sometimes gets her into trouble, and it's only aggravated by her discovery that she can easily escape the public eye. So when vandals romp through the local cemetery, she takes advantage of her new found anonymity and its unforeseen advantages as she launches her own unofficial investigation. Despite her oddball humor and unconventional snooping, Ivy soon becomes discouraged by her failure to turn up any solid clues. And after Ivy witnesses something ominous and unexplained, she can't resist putting her investigative powers to work again. Even the authorities' attempts to keep Ivy out of danger and her nosy neighbor's match-making schemes can't slow her down. But will the determination that fuels this persistent, quirky sleuth threaten her very safety? 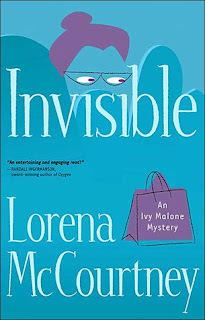 INVISIBLE was a fairly average book. Certainly like nothing I've ever read before though with the main character being somewhere between 65 and 80. The plot at the beginning was very intriguing and the characters were quirky and endearing. But as the story went on—and on, and on, and… well, you get my point—things just started going down hill. Starting with grammar and spelling. For me, that made my patience for everything about the book wear thin. Not to the point where I was angry, but where it seemed more like a chore to read than something for enjoyment. Unfortunately, that was in the last 25% of the story so I did not want to DNF at that point. Also, INVISIBLE has strong religious undertones. It didn't bother me, but I know some people are allergic to religion and, it's not something that I had known was included in the book when I picked it up since it was not mentioned in any write-ups. So, there it is, a little heads up. Overall, while an okay book, it just didn't do it for me. It was too drawn out with slow pacing in the last 50% for my liking. The humor in INVISIBLE is relatively tame but it's still there. Anyway, I'm not sure if I'll read the other installments in this series or not. I might if the price is right, but the pacing worries me. I'd recommend it to those who like mysteries with a cozy/religious slant and a grandmotherly protagonist and a quirky cast of characters.